Rosa Parks (1913–2005) was an African American civil rights activist, most famous for her peaceful protest on a Montgomery bus in 1955. Her actions helped to spark a civil rights movement across America. Find out more about this ‘mother of freedom’ whose strength and courage changed the lives of African Americans and paved the way for a more equal world. Then enjoy using our printable resources below to investigate further. Rosa Parks Day is celebrated in various American states either on 4th February, her birthday, or 1st December, the day she was arrested. The bus in which Rosa Parks made her famous protest can now be found at the Henry Ford Museum in Michigan, USA. In 1996 and 1999, President Bill Clinton gave Rosa two of the highest awards granted to US citizens – the Presidential Medal of Freedom and the Congressional Gold Medal. In 2013, on the centenary of Rosa’s birth, President Obama unveiled a statue of Rosa in the US Capitol Building in Washington, D.C. – the first full-length statue of an African American in the US Capitol. Rosa Parks was born Rosa Louise McCauley in Tuskegee, Alabama, USA, in 1913. Her father James was a carpenter and her mother Leona a teacher. When Rosa was two, her parents separated. Rosa, her mother and younger brother Sylvester moved to their grandparents’ farm nearby. Rosa’s grandparents were former slaves and Rosa lived in a world where it was normal for black children and white children to lead different lives. Rosa was taught by her mother, but at 11 went to live with an aunt in Montgomery to continue her education. When Rosa walked to the local school for African-American children, she saw the bus taking white children to the ‘better’ school in town. Rosa studied hard, but had to leave school at 16 to care for her dying grandmother and her sick mother. To support the family, Rosa learnt to type and began sewing. At 19, Rosa married Raymond Parks, a barber. Raymond encouraged Rosa to return to high school to gain her diploma. He was also involved in the NAACP (National Association for the Advancement of Colored People) and Rosa became the first woman to join the group in Montgomery. They wanted to do something about the treatment of black people and believed all Americans should be equal, regardless of their colour. At the time, southern states followed ‘Jim Crow laws’ giving ‘separate but equal’ status to African Americans. In reality this meant cities were segregated (divided). White and black people went to different schools, shops, libraries, restaurants, theatres and churches. They even had to use different toilets and drinking fountains. Rosa worked as a seamstress at a department store in the city. When she took the bus to work, she had to use seats reserved for black people at the back, or stand (even if there were empty seats up front). Then on 1 December 1955 everything changed. Rosa was taking the bus home when a white man boarded. With all the seats taken, the bus driver told Rosa and some other African Americans to stand up. The other three moved, but Rosa refused. When the driver threatened to call the police, Rosa sat still. 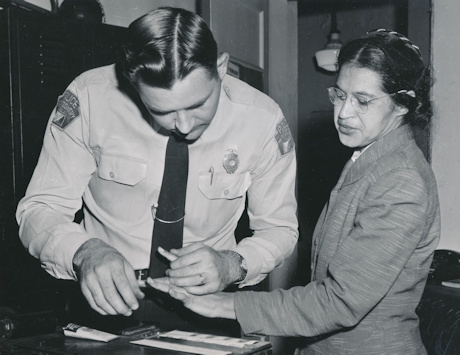 Rosa was arrested for breaking a segregation law and had to pay a fine. She refused, taking her case to the high court, because she believed the law was wrong, not her behaviour. Other leading African Americans, including Martin Luther King Jr, supported Rosa and decided to boycott (stop using) the city’s buses. They encouraged other African Americans to do the same. On the day of Rosa’s trial, 90 per cent of Montgomery’s African Americans (about 40,000 people) boycotted the buses, choosing to walk to work, or taking bicycles or shared cars and taxis. The boycott lasted 381 days and the bus companies lost a lot of money. Eventually the bus segregation laws in Alabama were changed and African Americans were free to sit wherever they chose. Rosa’s actions and the demonstrations that followed showed that non-violent mass protests could make a difference. As a well-spoken, respected working woman, Rosa’s voice was heard, and by challenging the law she inspired a wider civil rights movement across America. This eventually led to the Civil Rights Act of 1964, ensuring equal rights for all Americans and making segregation in public places unlawful. After the bus boycott, however, Rosa’s life was difficult. She and Raymond lost their jobs and were threatened by people who didn’t agree with their views. They moved to Hampton, Virginia, and later to Detroit, Michigan, where they continued supporting the civil rights movement. In 1987, they also set up a centre in Detroit helping young black people to find job opportunities – the Rosa and Raymond Parks Institute for Self Development. Rosa also wrote a number of books about her life. Rosa died of natural causes in 2005 at the age of 92. Over 50,000 people attended her memorial service in Washington, D.C. and her body lay in state in the US Capitol (a great honour). She had no children and Raymond and her brother Sylvester had already passed away. Rosa Parks was a brave but peaceful Civil Rights activist in America. Can the children design a medal to commemorate her achievements? The kids will need to do some research and practise their persuasive language skills to design a poster encouraging people to participate in the Montgomery Bus Boycott. Use this Rosa Parks booklet to write down your notes whilst studying this inspirational woman. You'll need our Origami Booklet Folding Instructions found here. Learn a little about the life story of Rosa Parks and how she helped change the world for the better with our short introductory factsheet. Rosa Parks is known for being an inspirational woman, but can the children find out a little bit more about her and record their findings on this worksheet? 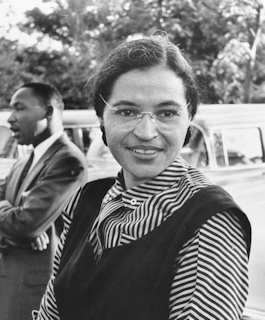 Write about Rosa Parks and her incredible achievements on this story paper. We have two versions to choose from: lined, and with handwriting lines. Our second Rosa Parks story paper is perfect for recording everything you learn about this remarkable woman. Introduce younger children to Rosa Parks with our simple fact-finding worksheet.